Evangeline Lilly attends the world premiere of “The Hobbit: The Battle of the Five Armies” at Odeon Leicester Square on Dec. 1 in London. The third and final installment of “The Hobbit” series hits theaters Wednesday, and it’ll mark the last time fans will get the chance to explore Middle Earth for the conceivable future. The trilogy of films — 474 minutes of orcs and elves — is based on a single novel by J.R.R. Tolkien that, according to my paperback copy, numbers 293 pages. In other words, the filmmakers have wrung all they could out of the source material. Take, for instance, a sequence from the first film — “The Hobbit: An Unexpected Journey” (2012) — in which the traveling party is beset by stone giants having an elaborate, and presumably very expensive, CGI rock ’em sock ’em robots battle. One sentence! And the stone giants were never heard from again! Indeed, compared with other recent films adapted from works of fiction, “The Hobbit” movies are outliers. I pulled the run time, according to IMDb, of 54 popular films released since 2000 that were based on novels. I then found the page count for each book using the top-selling edition on Amazon. Page counts aren’t always the same among editions, but we’re just looking for an estimate of length. It’s tricky to find an authoritative word count, which would be ideal. For books that were split into two films — think “Harry Potter and the Deathly Hallows,” “The Hunger Games: Mockingjay,” “The Hobbit,” and “Twilight: Breaking Dawn” — I found the last chapter used in the first film and split the books there. The conclusion? 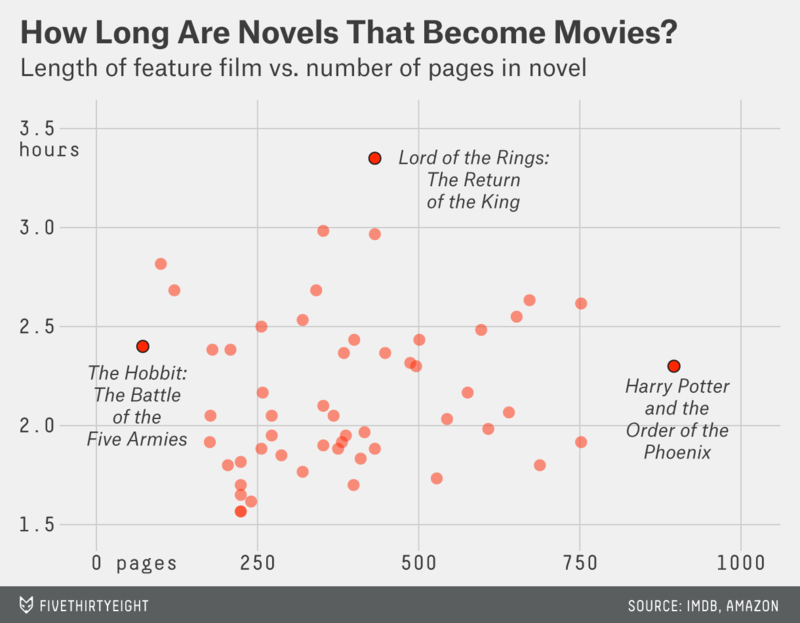 “The Hobbit” movies are the only films with more minutes of film than book pages. There was 1 minute, 41 seconds of film per source page in the first film; 1 minute, 20 seconds per page in the second; and an unprecedented two minutes per page in the last film, which clocks in at 144 minutes and is based on only 72 pages of source material. The closest runner up is “The Great Gatsby” (2013), which was 143 minutes long and based on 180 pages of source material. Even then, there were 48 seconds of film for each page. What about the movies that take a lot of source material and compress it into a comparatively brief film? The most efficient film I pulled was “The Bourne Ultimatum” (2007), a 115-minute movie based on a sprawling, 752-page Robert Ludlum novel, leaving it about nine seconds of film per page. Next in line for brevity is “Harry Potter and the Order of the Phoenix” (2007), which was the longest book in the series yet had the second-shortest film. The first three “Twilight” films and the other “Bourne” movies were also comparatively brief. So, if you catch “The Hobbit: The Battle of the Five Armies” this weekend and are fatigued by minute 20 of the eponymous battle, take heart in the fact that Peter Jackson at least had the courtesy of making the Hollywood adaptation shorter than the audiobook. That is, at least, until the film’s special editions come out.